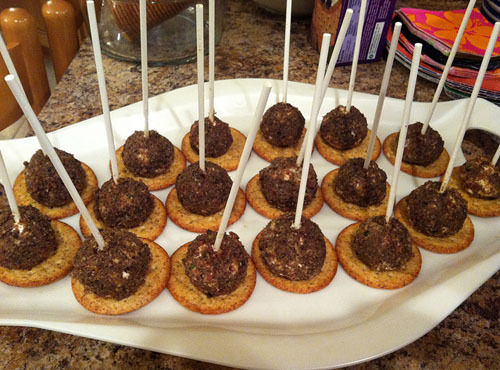 I have been plotting and planning what to make for Kenn & Jenn's annual Super Bowl party for weeks. The winning recipe (from Pinterest of course!) was goat cheese lollipops coated in bacon and herbs. 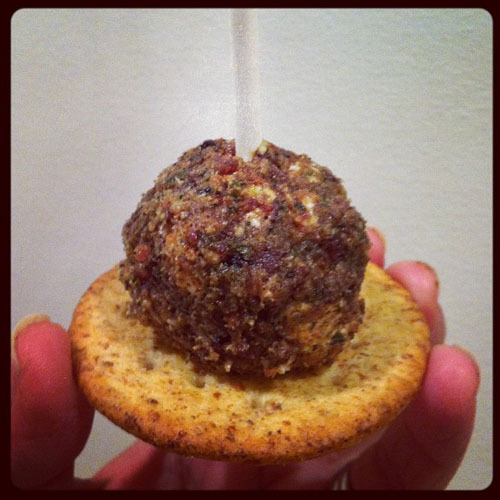 They were pretty easy to make and really... isn't food on a stick more fun to eat? I made these, too! I thought it was too cheesey. (which, for how much I LOVE cheese might sound odd) So I mixed some of the chopped bacon, herbs & nuts into the cheese mix and then rolled in the bacon, herbs and nuts. Which herbs did you use? I tried dried parsley (blech!). The fresh rosemary was the best received. I used fresh basil and thyme. I think rosemary would be even better.